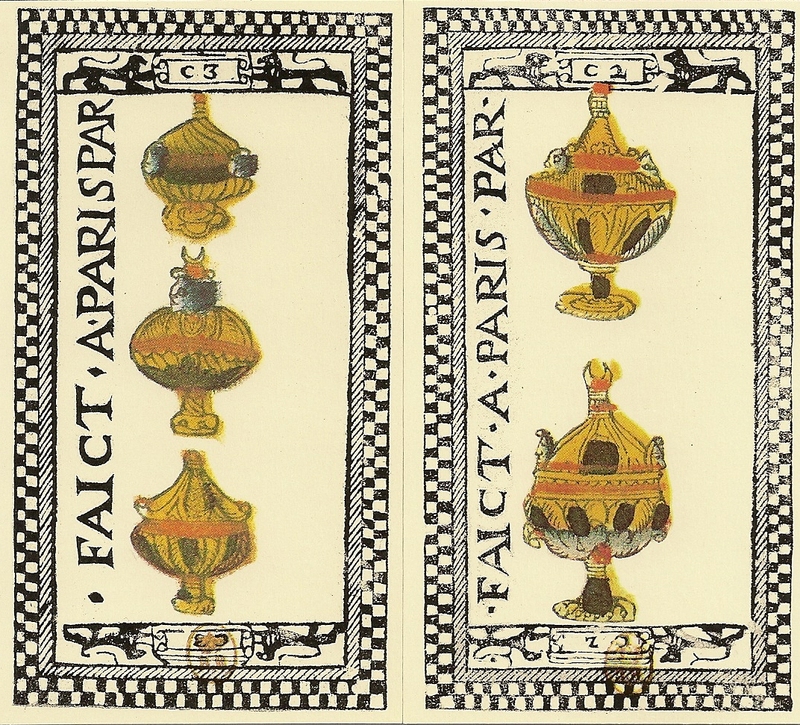 The author of the Tarot de Paris is unknown. 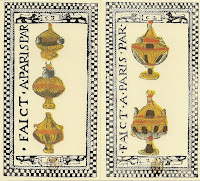 On the 2 and 4 of Coins, and the 2 and 3 of Cups appears an incomplete reference that reads ·FAICT·A·PARIS·PAR· ("made in Paris by"). There are empty spaces reserved for the name of the maker but it is missing. The original deck is housed in a collection at The Bibliothèque Nationale. Under the direction of André Dimanche it was reprinted by Grimaud in 1984 as a not numbered limited edition. Dimanche has written a historically detailed essay for this deck’s booklet. The original images were woodblock printed and stencil colored. The checker pattern borders simulate the technique used in Italy in which the back papers were folded over the edges of a card. 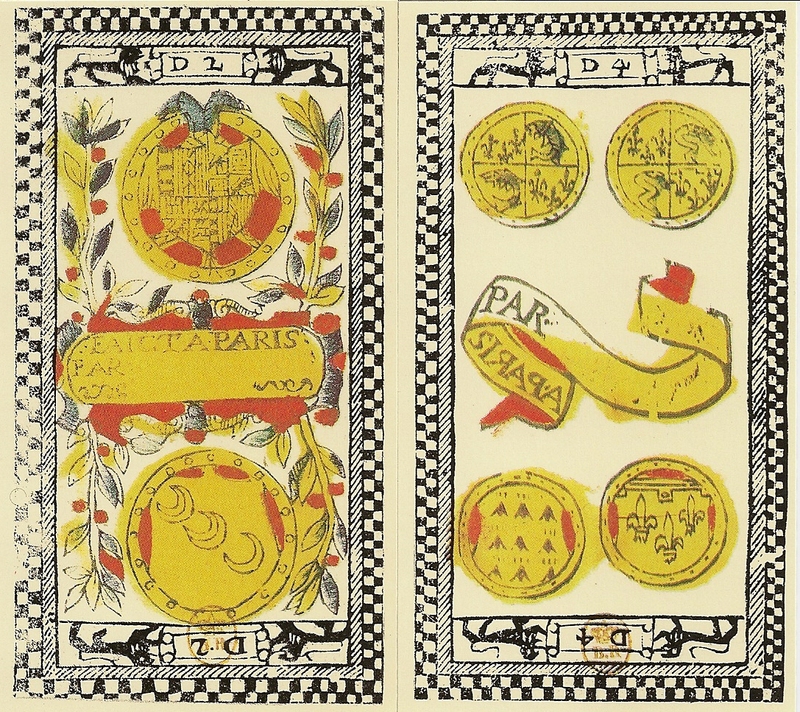 The Parisian cardmaker also used the Italian suits of cups, curved swords, cudgels and coins. The trumps have French titles at the bottom, but their spelling is sometimes strange e.g. LE PANDUT for LE PENDU, LA TREMPANCE for LA TEMPERANCE. 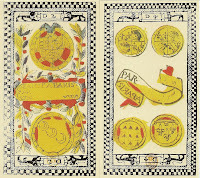 The Tarot de Paris follows the numbering of the Tarot de Marseilles. Some of the card designs are clearly related to the TdM, but many have unique imagery or are related to other decks. Some of the details in the facsimile version published by Grimaud is difficult to see clearly, because the colours used in the original have darkened obscuring some of the lines. 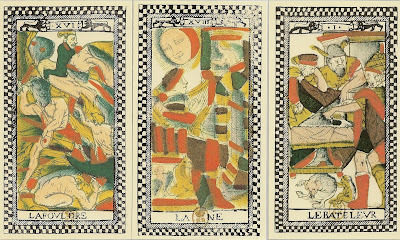 Unlike in any other tarot known, the Aces feature the suit sign on a large flag held by a lion (Coins), a deer (Cups), a griffon (Batons) and an unicorn (Swords). This was probably influenced by German hunting decks, which often have very similar flags appearing on the 10s of all suits . Another oddity is, that they are named 'AR' instead of 'AS'. 22 Arcani "i Cani del mondo"
(c) Eno. Design "Awesome AG". Powered by Blogger.